The Liars' Gospel takes place around the life and death of Yehoshuah (Jesus), told from the perspectives of his mother Miryam (Mary), his friend and eventual betrayer Iehuda (Judas), the High Priest Caiaphas, and the rebel Bar-Avo (Barabbas). I have to admit, I was a wee bit uncomfortable about jumping into a book I knew would be a fictionalized version of biblical events, and with such a provocative title at that (who's being called a liar?!). But, since I'm not a biblical literalist, my curiosity easily won out. First off, the language. Now, this isn't something I usually comment on, or even care much about, but it occurred often enough that I feel the need to mention it. The f-word is used fairly often, as well as some other offensive terms. Part of me understands why these words were used, but more often than not I found it distracting. Maybe because the novel is written in a biblical setting? I'm not sure. But if you greatly dislike profanity, just a heads up. That aside, I found Alderman's vivid storytelling incredible, giving readers deeper insight into the historical context of the Gospels. I personally discovered how woefully ignorant of this time period I am. At the end of the book, Alderman provides notes on her sources. I also stopped a number of times to look up "Judea as Roman province" or "prefect Pilate ancient Israel" to get my bearings. When we say in the Apostles' Creed that Jesus "suffered under Pontius Pilate," from now on I'll be reminded of the countless others who were also subjected to Pilate's mercilessness. The fictional details of the character's personal lives also add to their depth and relatability. We are shown a very human side of Mary, with what I think are completely natural, motherly responses to Jesus' actions. We also see Judas as more than simply "the betrayer." My favorite scenes were the ones between Judas and Jesus: endless questioning, discussing, freedom to wonder and challenge everything. "This questioning is the wisdom I taught you... Use it always with me." 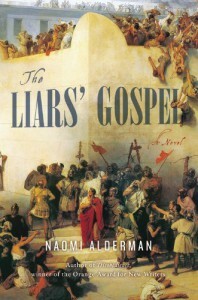 Through The Liars' Gospel, details of life and faith during early Roman rule of Judea become a rich and vibrant story. Alderman gives a unique Jewish perspective to this familiar Christian account, creating a story that prompts much thoughtful consideration.